What is the true nature of a beast in the BatB universe? Is a beast simply a controllable weapon bred through genetic coding and DNA manipulation? It certainly seems like that was the purpose behind the experiments by Muirfield and the sinister organizations that came before. However, apparently, a subject has to have some inherent traits in order to be susceptible to the beastly transformation and if we remember, Tori was born a beast; simply through inheriting her father’s DNA. Is the beast nature inherent in these subjects, and is it by nature violent and evil? In this narrative, beast nature is most often presented as uncontrollable and undesirable. For a long time, one of the main storylines was about eliminating or at least suppressing this dark side of our hero Vincent, and even finding a cure; as if it is an ailment. To be sure, the beast persona was forced upon most of the unsuspecting subjects, and their weaponization most assuredly was non-consensual. Gabe’s motivation certainly is questionable at best, but he is of the thought that; once a beast, always a beast. That at some point this dark nature will rear its ugly head and consume the person possessing it to a point of no return. It seems that Gabe’s prophecy is a self-fulfilling one. Gabe has stepped up his quest to capture and eliminate Vincent by not only tailing Catherine non-stop, but by taking her professional authority and resources away through suspension. It finally occurs to our heroes that Gabe himself has quite the sordid past that they may be able to use against him. As they look through the police database they find a cold case that was shelved by DA Lowan himself, back when he was still the bad guy trying to set up the Vigilante/Vincent. I am glad that the show has decided to explore this side of Gabe once again. I was a little perplexed at how easily Gabe was rehabilitated, especially in Cat’s eyes. I never quite bought into the forced switch in his character in order to create a love triangle of sorts. But now this choice makes more sense. It allows us to explore this beast nature concept more fully, and to watch Gabe’s slow decent into full darkness is compelling. As our team, with JT noticeably and regrettably absent, tries to turn the tables on Gabe; things are complicated by the surprise return of Cat’s sister Heather (Nicole Gale Anderson) She is in town to share the exciting news of her engagement, and conveniently, she happened to be part of that cold case. It involved Vincent saving Heather from a mobster who then was violently disposed of by Gabe in the aftermath. Vincent and Cat track down a witness who saw Gabe commit the murder, but before they can celebrate, Gabe tips the mobster’s brother off to Vincent and Heather’s involvement. This is quite a turning point for Gabe, since now he is not only going after Vincent; he is purposely putting Cat’s family in danger in order to accomplish his goal. Cat will surely not forgive him that. Heather is once again disappointed in Cat’s standoffishness and subterfuge and when she finds out that she is still involved with Vincent, Heather confronts her sister. Desperate and cornered, Cat tells Heather the truth about Vincent, but she will have no part of this cockamamie story. Of course when Heather gets kidnapped by the mobster-brother to serve as bait for Vincent, she soon finds out the truth. Just as Cat and Tess storm in to save the day, Vincent beasts out to rescue both Heather and himself from a violent explosion. 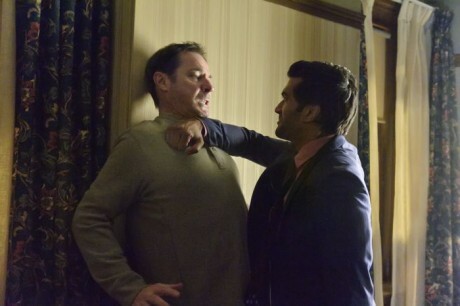 Finally the stage is set to expose Gabe when the witness picks him from a lineup at the precinct, but when he makes bail, Gabe breaks into the safe house and not only threatens the witness to keep silent, but ends up strangling him in a fit of rage. As he catches his reflection in the mirror, Gabe finally succumbs to what he fears the most, what he has tried so hard to suppress by eliminating Vincent; his beast within. What makes a hero and what makes a villain? Is it an inherent, ultimately irrepressible nature? Is it chemical manipulation? Is it the loyal company of friends and lover that allow Vincent to use his beast within for good? Is it the rejection of love that turned Gabe? There is something in the very depth of these men’s make-up that allows them to become beasts. Perhaps what makes them heroes is found there too. Give us your thoughts on this dark turn of events, Beasties! I would love to hear where you think this story is going and how things may be left at the end of the season and what that means for next Fall. On a personal note, I want to thank you all for being patient with me this week. I had a little mishap and doctor’s visits and pain meds derailed some of my live tweeting and getting to this review. Your support is very much appreciated.